These few lines from the theme song from “The Polar Express” written by Tom Hanks express almost completely how I felt while writing this post. 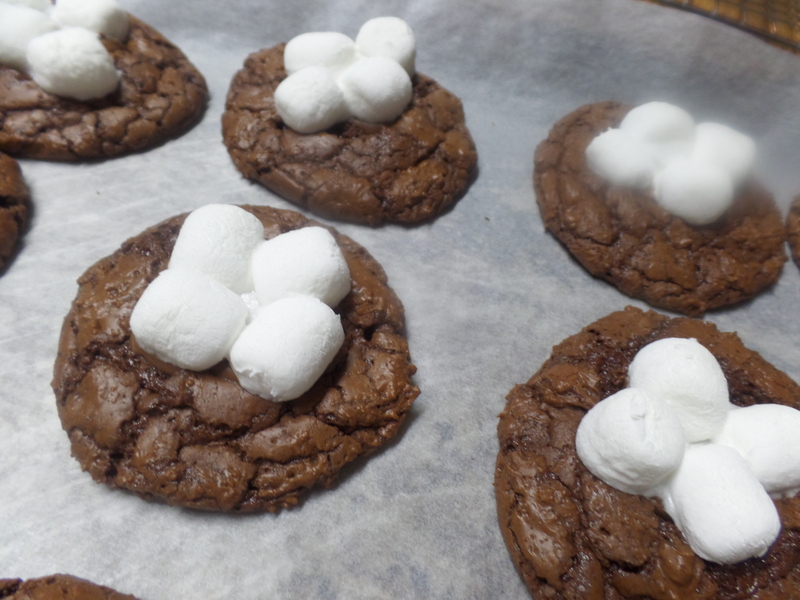 I was rushing to be on time, looking for the ingredients and hoping for the best outcome for our Polar Express Hot Chocolate Cookies. Whether it’s because I believed in the recipe or if things just often fall into place at Christmas time, these cookies turned out great and are possibly the most chocolaty cookie I have ever eaten–a perfect compliment to your steaming cup of hot chocolate. Or, if you’re like me, hot coffee. They are very rich and I’m willing to bet, though you’ll want to eat more than one or two, you won’t be able to do it. In a small sauce pan, heat the butter and the chocolate chips until melted together over low heat. Set aside to cool about 5 minutes. While the chocolate mixture is cooling, mix together in a large bowl the brown sugar, eggs and vanilla with an electric mixer on low until just combined. Gradually add in the cooled chocolate and mix with the egg mixture. Mix together and add to the chocolate mixture. Cool in the fridge covered with cellophane for 2 hours or so. Remove from fridge and drop by Tablespoons onto two cookie sheets. My cookie sheets held about 12 each at 2 inches apart. 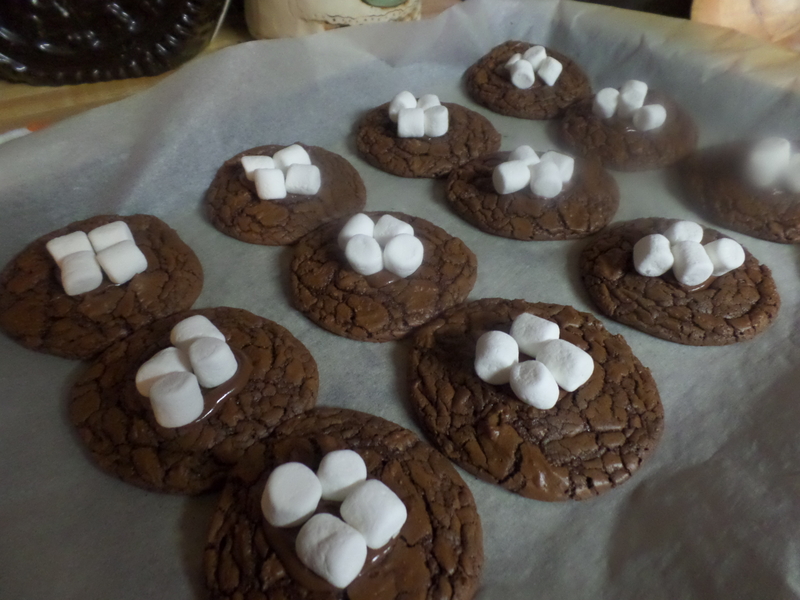 Remove from oven and place 1/2 chocolate piece on each cookie and top with 4 mini marshmallows. Pop back into the oven for an additional 4 minutes. Let cool 5 minutes on the cookie sheet before removing to grates. In a separate bowl, add the rest of the dry ingredients except Hershey's chocolate and mini marshmallows; mix together and add to the chocolate mixture. Cool in the fridge covered with cellophane for 2 hours or so. Remove from fridge and drop by Tablespoons onto two cookie sheets. Bake at 325 for 12 minutes. 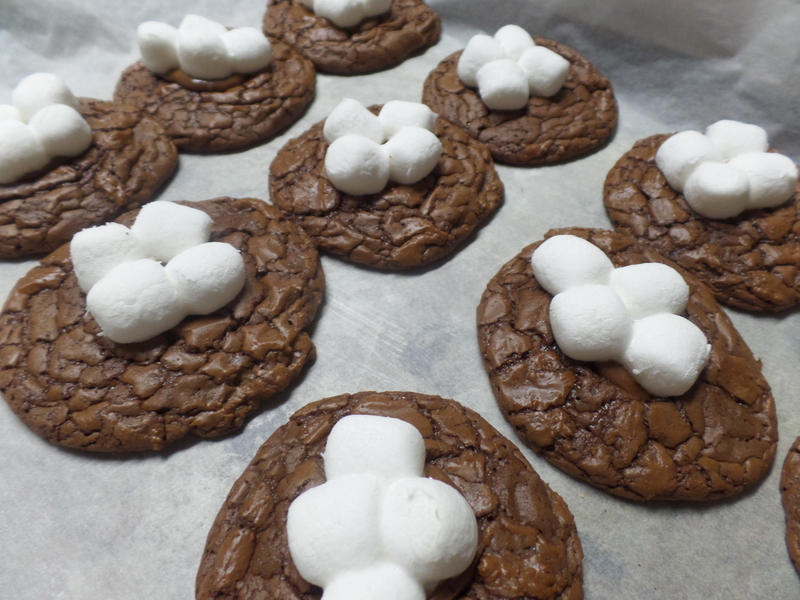 Remove from oven and place 1/2 chocolate piece on each cookie and top with 4 mini marshmallows. Pop back into the oven for an additional 4 minutes. Let cool 5 minutes on the cookie sheet before removing to grates.